Single, or with family and friends, the only equipment necessary is the love for sun, sea and fun. You can join one of our organized sailing programs. This is the ideal, cost effective way of exploring and getting to know the Greek islands. They combine adventure, companionship, -you will meet new people and make friends which may last a life time-, comfort and a feeling of freedom you can only experience at sea. It is not necessary to know anything about sailing, our skippers will be happy to introduce you to the sailing skills. They are highly trained and very experienced. They speak English, some of them German and French and can orientate you in Greek history and culture. Coming with your family or friends, you have the possibility of having a yacht to yourselves and plotting your own course. At the end of your trip ask for your "Golden Sailing Certificate". Alternatively, you can fit a sailing cruise into your holidays in Greece. Skippers hired by Aegean Cruises have been with us for many years and are multilingual. 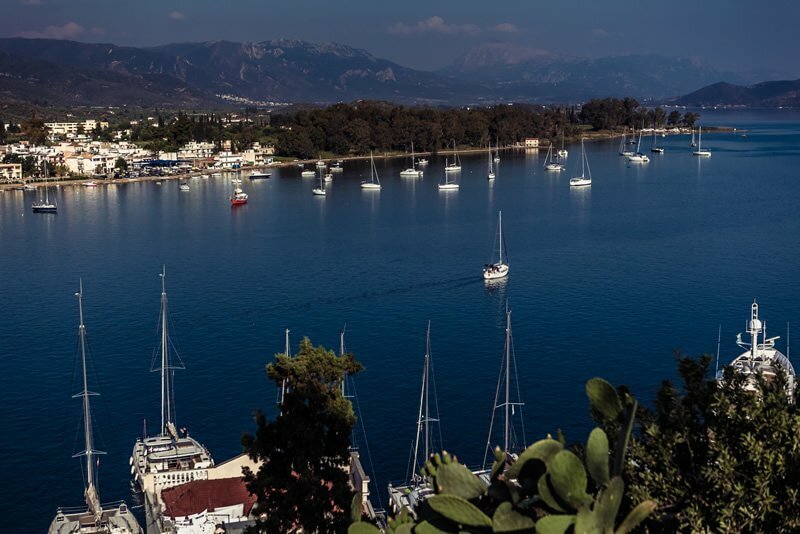 They have been sailing in Greek waters since childhood and are well known participants in the Greek yachting and racing community. Each skipper has met strict Aegean Cruises' standards for sailing ability and personal qualities. Our skippers are trained in all types of boats and are excellent instructors. They give you a feeling of security onboard, are outgoing, responsible, and always cooperative. Skippers are always ready to make you feel at home, fulfil your every need, and show you the secret treasures of Greece discovered by them through their years of sailing. They will teach you how to handle the boat and can orientate you in Greek history and culture. By the time your charter starts you will already have met a friend who sincerely wants to help you make the most of your sailing holiday and not just a professional skipper. First rate guides, deckhands, and cooks can also be engaged on Aegean Cruises yachts upon request. You will feel at home on board one of our yachts. They are chosen for safety, speed and comfort. Modern and fully equipped, they include all the amenities necessary for a luxurious life on board. Sizes from 11 to 16 meters, with 3 to 6 cabins, they can comfortably sleep 6 to 12 guests. After breakfast or even a morning swim in the crystal blue waters, we set sail. You can help the skipper with the sails and steering, or just relax and enjoy the carefree sensation of being at sea. In a few hours the light breeze will bring you to one of these picturesque and peaceful bays. Now you can enjoy the warm water, swimming or snorkelling, perhaps a chance to go fishing or even windsurfing. Later on in the afternoon, our sails up once more, we will lead you to a safe island harbour just waiting for you to explore. The night life is full of surprises, in the tavernas with wine and "syrtaki", or at an open-air disco or even under the stars enjoying the charms of nature. 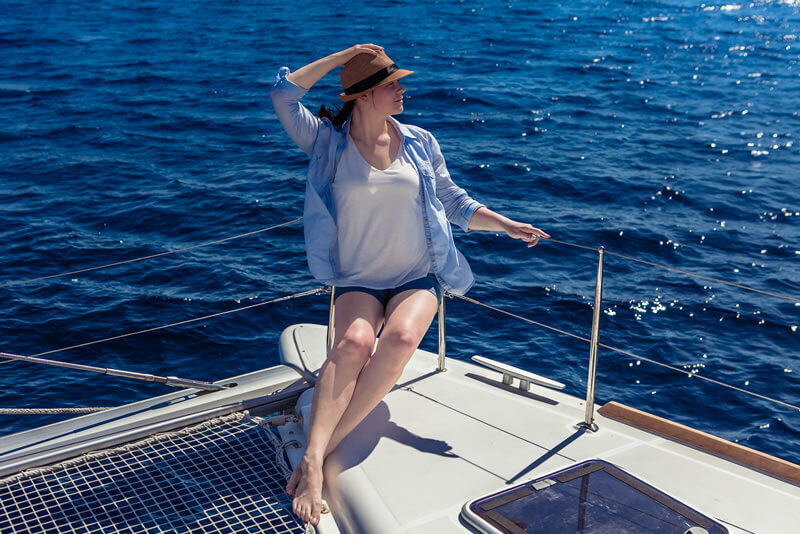 As an alternative to an individually chartered yacht, Aegean Cruises offers regularly scheduled 7 & 14 Day Skippered Charters on a per person basis from April to October. If you are single or with family and friends, the only equipment necessary is love for sun, sea and fun. 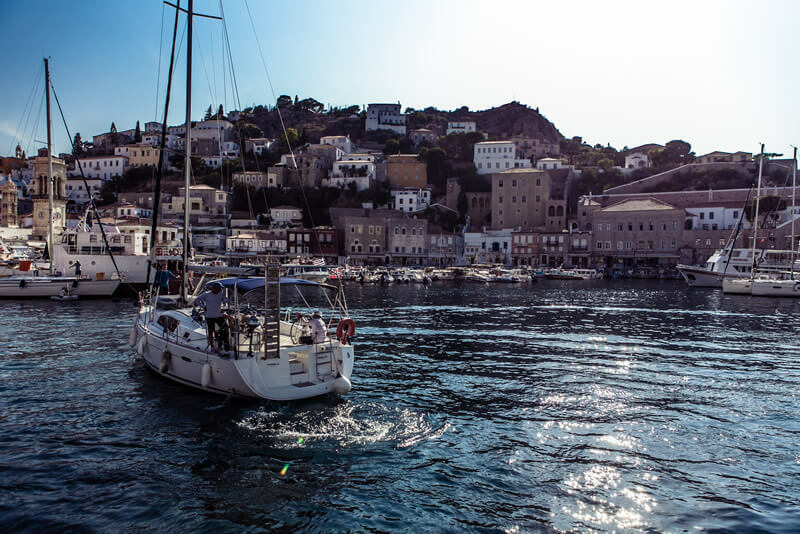 This option is a great opportunity to sail and explore the Greek Islands without the responsibility, cost, or experience required for a bareboat charter, but with all the fun. You will be sailing the islands aboard a customized 45 to 55 foot sailing yacht, accomodating up to 12 guests in a functional and spacious interior with 3 to 5 double berth cabins. Whether relaxing below deck after exploring a village or sunbathing on deck after a peaceful swim in a remote bay, your comfort and enjoyment is assured. Beginner and novice sailors will also benefit from the opportunity to learn first hand about sailing through instruction from the skipper and onboard sailing books. 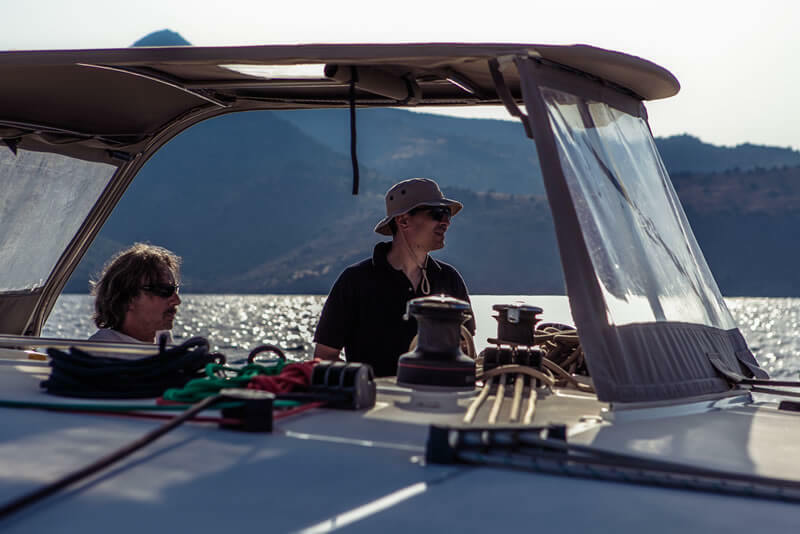 The skipper, in addition to being responsible for the safe and enjoyable sailing of the yacht, is also acting as personal guide and caretaker for the guests both on and off shore. A sailing cruise with Aegean Cruises is the ideal environment to meet people from different countries and cultures, enjoy the wonderful Greek Island life and seas, and visit the best islands and villages. Whether it is dinner and late partying in Myconos, a stroll through the harbortown in Naxos, an afternoon spent exploring the archeological island of Delos, a morning of shopping in the chic harbor town of Hydra, or a peaceful day on an uninhabited island, you can do it all, and without the hassle and cost of booking hotels, transportation, or tours.